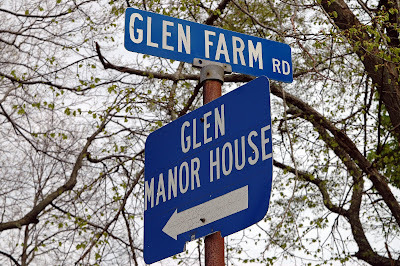 Welcome to Farmgirl and Farm Friend Friday blog hop #5! Your happy hosts are your's truly and Amy of Verde Farm. I got the biggest kick out of Leslie's entry over at Farm Fresh Fun. Her son really has a special way of grooming his pony that you should see if you didn't make it by. I also really enjoyed my visit at Lilac Lane Cottage . 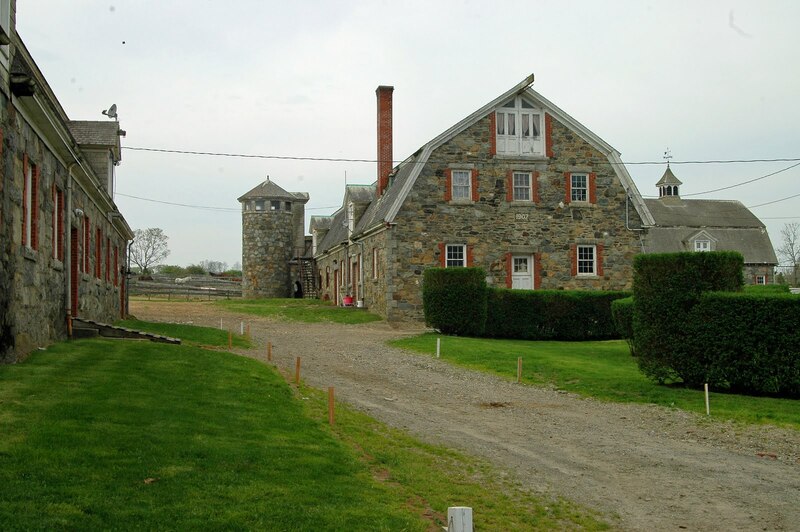 Maura has a beautiful way of sharing her daily family farm life. It's time to link up for your weekly dose of farmgirl soul food and go visit your creative, farm lovin' blogging friends! 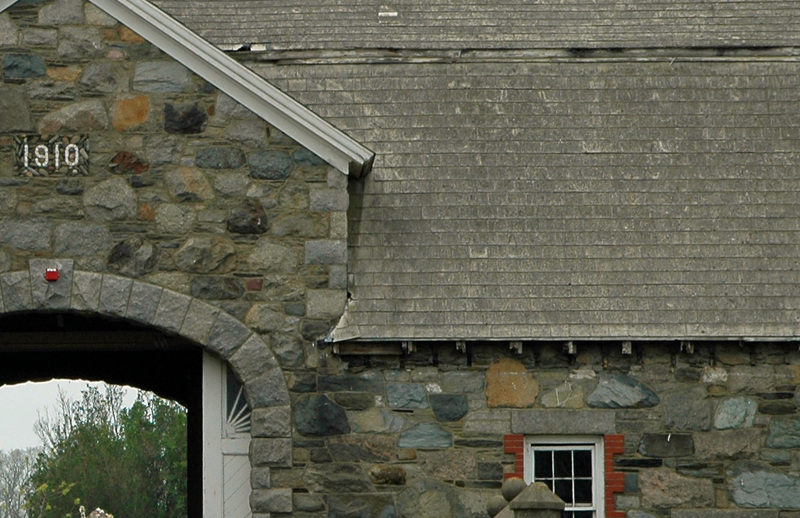 Thanks again for linking up and don't forget to leave a note on the barn door on your way out! I came across this little red book at my mother in law's house a while back and couldn't put it down.I love vintage books and ideas too! 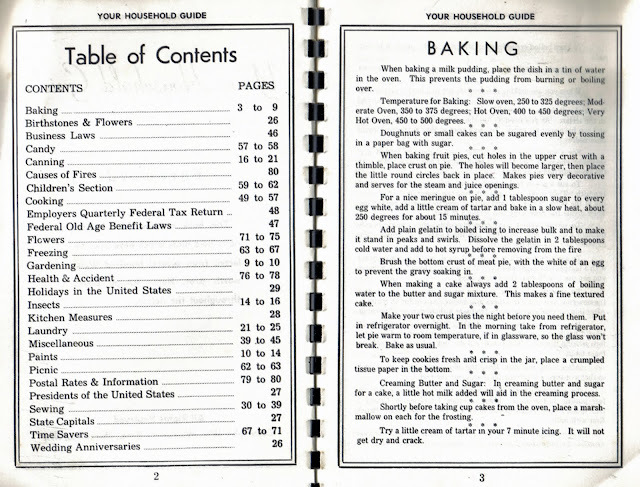 Just look at that Table of Contents list! 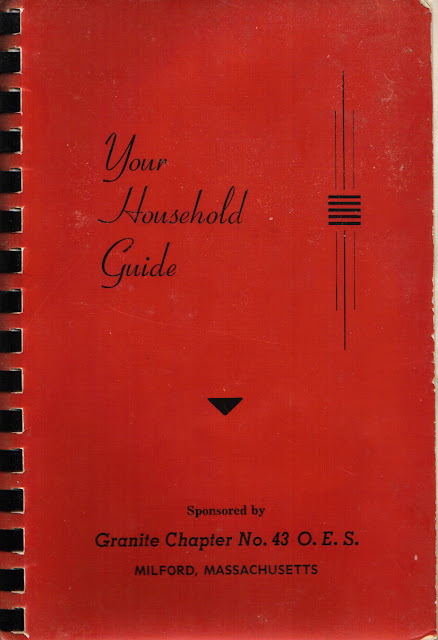 Printed in 1951 by Walsworth Bros., this book contains 1001 helpful household hints which were selected from several hundred Walsworth Bros. Home Recipe books throughout the nation. Since it's planting season, I thought it would be fun to share ten old school garden tips from the Garden Section! I know I have some savvy readers so do leave a comment and let me know if you have tried any of these and how it turned out! Plant sunflowers with your pole beans. Saves time spent in cutting poles and also protects beans from frost. Turn fruit jars over earliest planted vegetables. They will come up quicker. Plant radishes and cucumber seeds together to keep bugs off cucumbers. Paper egg case fillers make excellent containers in which to sow seeds in the house. Placed in flats and filled with light loam, seedlings will soon appear and may easily be transplanted without removing earth around them. Build a trellis for your cucumber vines, it makes them easier to pick and saves space in your garden. When Planting pea seed in the spring, sow zinnia seed in the same row at the same time. 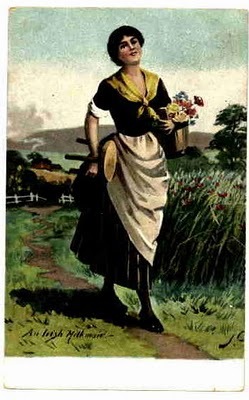 Your flowers will bloom long after the peas are gone. This saves space and beautifies your garden at the same time. To keep worms off cabbage- 1 pint saltpeter and 3 pints of salt. Dissolve in 6 gallons of water. Sprinkle on cabbage as needed. A never failing proof against cabbage vermin. Two tablespoons Epsom Salts and 1 table spoon soda to each gallon of water makes a spray for bean beetle. Before working in the garden or doing other rough work, rub your finger nails with a piece of soap. This will prevent the earth from getting under the nails, and when you wash your hands the soap comes out easily. I can't wait to hear which of these old ways have made their way into your Garden! I'm linking up to the Homestead Barn Hop with this post today! 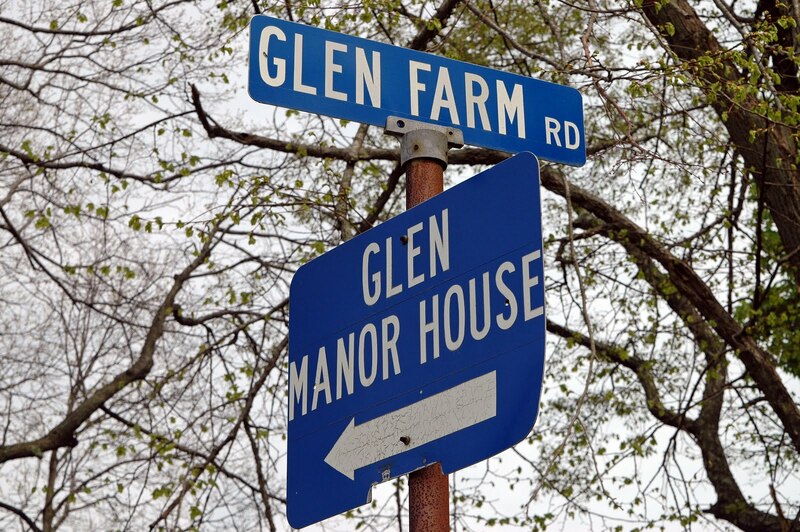 Come by and meet more fun homesteaders in blog land!
" Waiting on the Tide "
Thanks for looking and Happy Easter! Welcome to Farmgirl Friday and Farm Friends Friday blog hop # 4! Once again I was blown away with so many fun and imaginative entries last week. I'm so enjoying this blog hop. I love seeing the birth of new farm babes and chicks, new growth in your gardens, and delicous wholesome food coming out of your farm kitchens. How am I supposed to slim down for summer when Sherry of Barnhouse News is baking yummy whole wheat loaves of bread by the bakers dozen and Lori of Skoog Farm Journal is cooking up delicious looking farmgirl soul food for the last of these cool spring days? You girls know how to wrap up a day on the farm in style! Now it's your turn to entery this weeks Farm Girl and Farm Friends Friendzy! Once again, thanks to everyone who participates in this hop! It's great because of you and all you share. 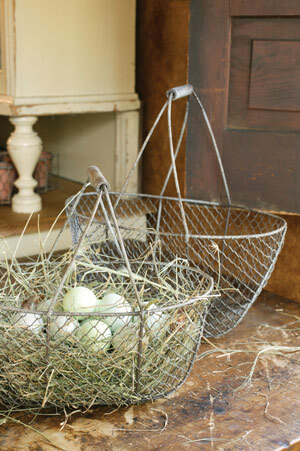 Image from Wiltsi Bridge Country Store " New " vintage inspired wire baskets. It won't be long and our basket will be over flowing with more eggs than we can handle! 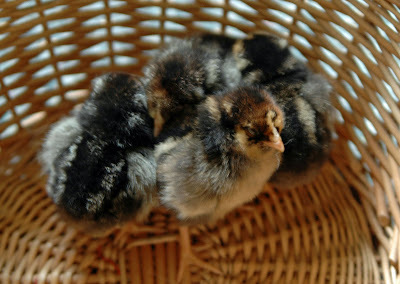 I've been collecting our eggs in a bright red bucket for a few years now, but lately I've had my eye on what you might call the " real deal " for collecting eggs properly and safely. 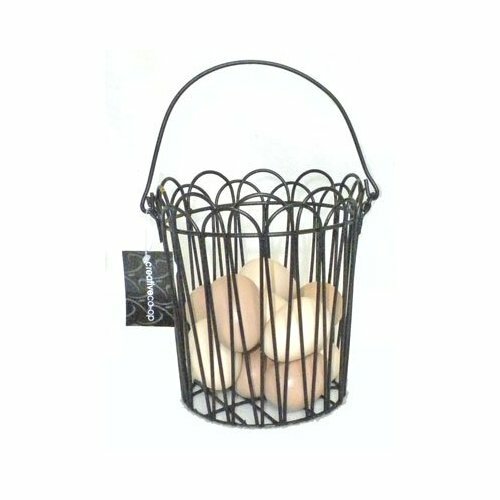 Wire egg baskets were designed in such a way that you can stack many fresh eggs inside with out the worry of breaking them before you get them inside and into your next delicious egg dish. The blue one above is a new model from Lehmans. 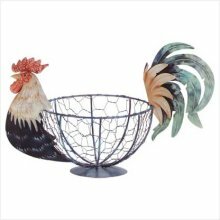 It mimics antique wire baskets in shape but it has has plastic coating to prevent rusting. 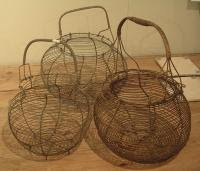 These are primitive wire egg baskets I found at an online antique store.. I rather like these. They are so cute you could collect and store them in one container! 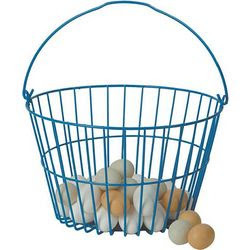 This one is adorable and available through amazon with faux eggs inside for decorative purposes, but I think you could ditch the fake eggs and use it for collecting. This fellow is handsome and would make a nice addition to your farmhouse kitchen! You're sure to run across some antique wire egg baskets in your local antique mall, antique stores, and online at Ebay and Etsy too! What do you collect your farm fresh eggs in? Homemade Living Book Series ~ a Give Away! 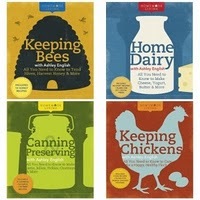 With so many folks working hard at living a more sustainable lifestyle we can use all the help we can get learning the basics and how too's of Keeping Chickens, Bees, Canning and raising animals that provide us with our daily dairy needs too. 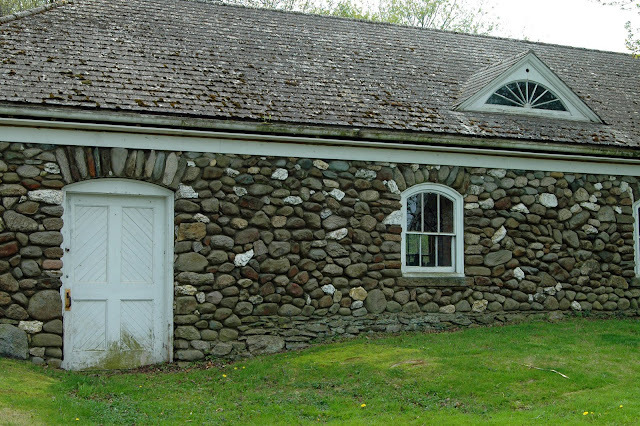 Today I'm sharing an exciting give away that Amy of Homestead Revival is doing. She's giving away the book series titled Homemade Living! 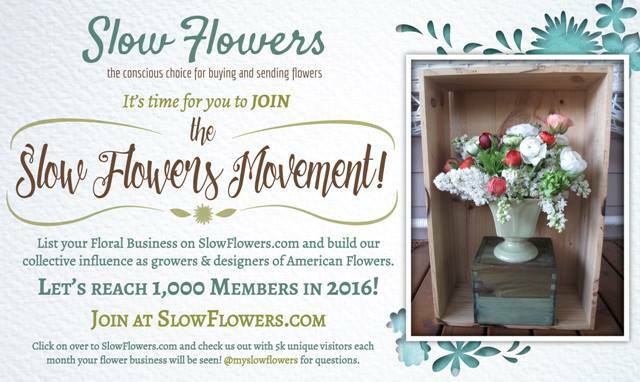 Visit her blog to learn more and enter the give away. These books would be right at home on my book shelves and I have a hunch many of you would enjoy them too! Have a wonderful day and good luck!
" Road to Heaven "
As always, thanks so much for looking. Welcome to the third Farmgirl /Farm Friend Friendzy blog hop hosted by Amy of Verde Farm and yours truly! 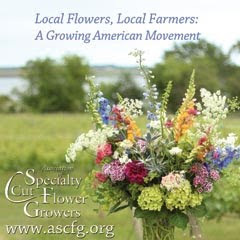 Springtime on the farm is a busy time of year whether you are a small back yard farmer, a rancher or homesteader staking out your plot of land and getting back to basics. Speaking of getting back to basics, have you ever tried making your own laundry soap? 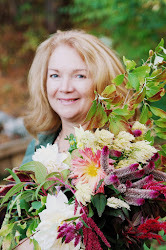 Kristin, of Sweet Country Life entered a terrific tutorial as did Carrie of Farming on Faith. I haven't tried it yet, but after reading both recipes, I think it's definitely doable!!! A big THANK YOU to everyone who entered, followed and left a howdy on the way out! This is just a great blog hop all because of YOU!!! Sometimes a farm girl just needs to head out on the open road and see what she can see! We did just that a while back and look what we found! Here's a few shots of an old farm from the Farm Coast area in southern MA. Seeing these old stone buildings really made us feel as though we had stepped back in time. Almost as if we had gone to another country. 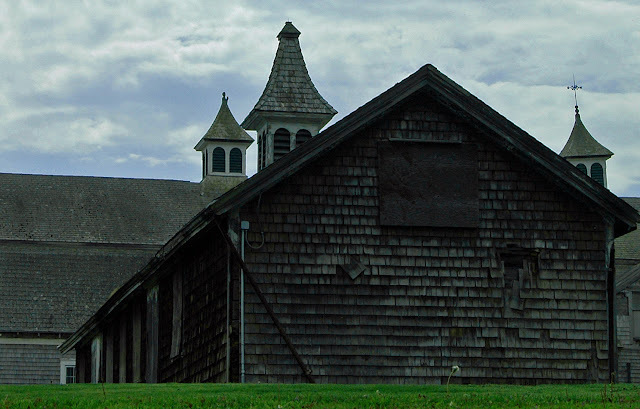 There was a bit of mist in the air which added to the mystery of this old place. 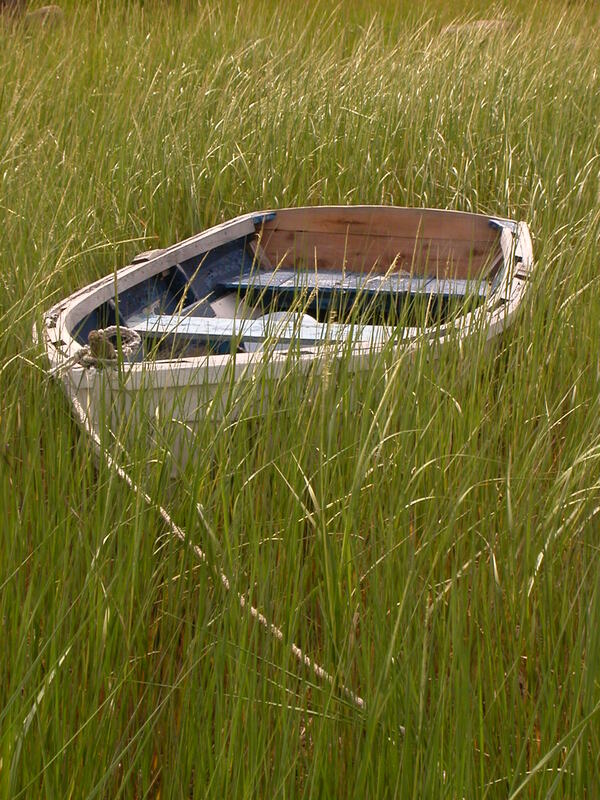 It was old, but not abandoned! The gal in the archway is leading a horse out for a young rider who is not pictured here but was waiting their arrival. Now it's your turn to link up for your weekly dose of farmgirl soul food! 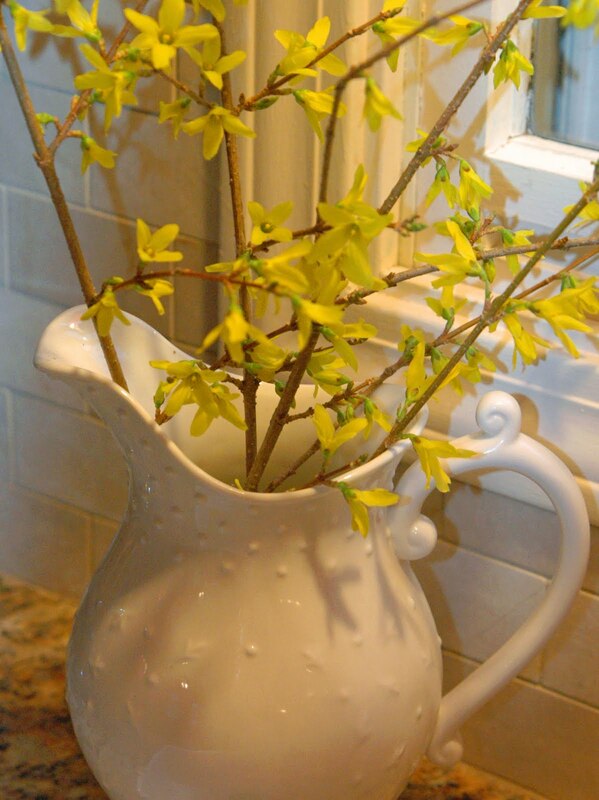 One look at these early spring Forsythia blossoms and we can be certain there's no turning back the weather clock now. That being said, April is a mix of weather along the South Coast of Massachusetts. 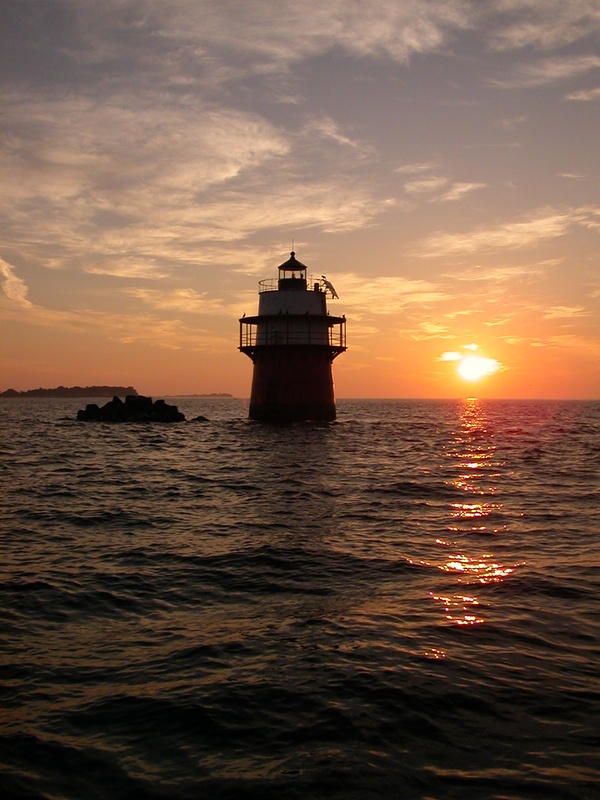 One day it will be warm and clear and the next we'll be in mist and cooler temps. I feel like a chameleon this time of year. My mood tends to match the weather. If it's warm and sunny, there's no stopping me! Cool and cloudy days make me feel fuzzy headed and unsure of what to tackle next. Today, we are under dark clouds, pouring rain and rumbling skies. The air outside is electrifying, charging the plants with the energy they need to grow! I swear I can see the grass turning greener with each passing hour. 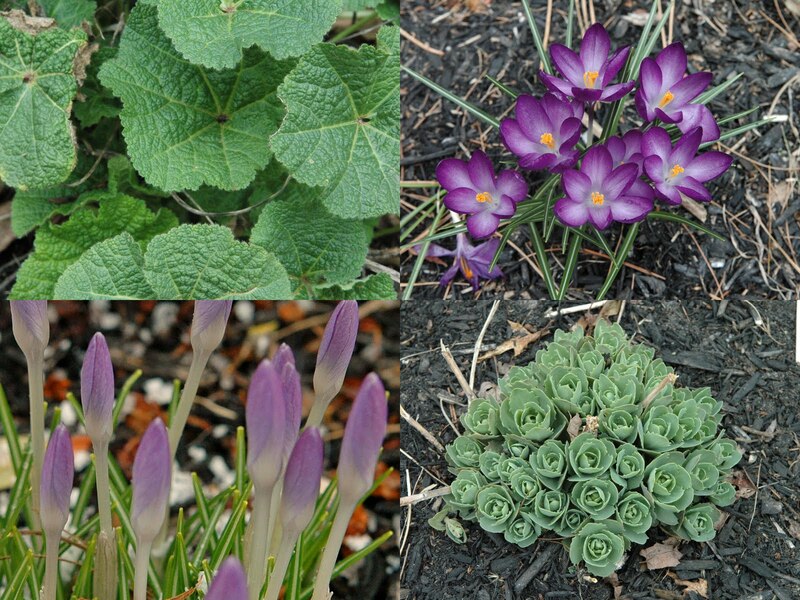 While the storm carries on, I'll share some early Spring Garden snippets! The crocus were covered in a dusting of snow on the first day of spring, but that didn't stop them from making a show stopping appearance of bright purple blossoms a week later. I'm happy to see the Hollyhock's made it along with the Autumn Sedum Joy. The Bird and Butterfly Garden is waking up from it's long winters nap too but no photos this time as there is nothing noteworthy to see just yet. Garden planters now bare, wait to be filled. 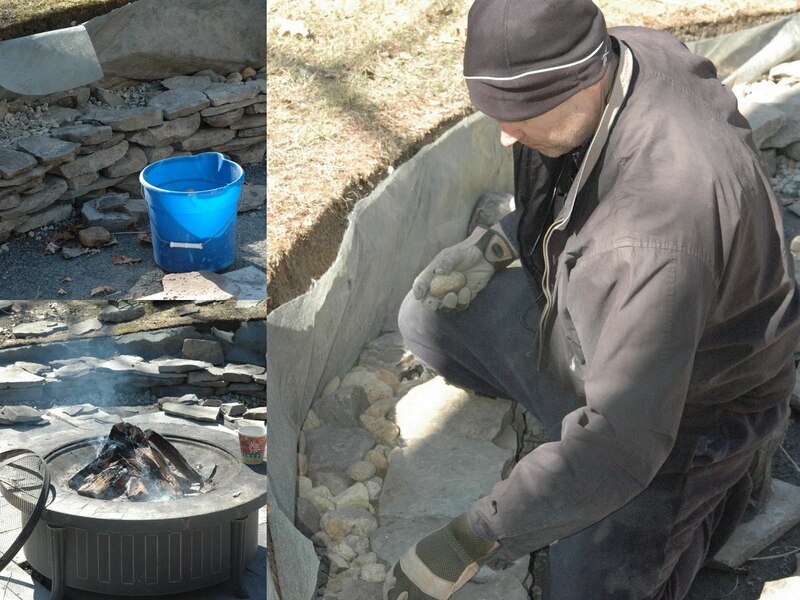 The Stone man has been hard at work ( on his knees in the cold ) on our stone wall and patio made from reclaimed granite slab pieces scavenged from stone yard dumpsters ( with permission of course ). Who's idea WAS THIS anyway? He's doing a wonderful job! I can hardly wait for our first evening fire in the council ring and gazing out my kitchen window at bright red potted Geraniums and Herbs! He keeps warm by the fire during coffee breaks! I'm always amazed at the live plants and shrubs inside the box when I order by mail! This Lady Banks rose bush already has some small buds... I hardened it outside in a protected shady area before planting it near the hen house. She'll need a trellis to climb on but for now she's fine and looking very healthy! That's it for " Garden Snippets " this time...! What's happening in your early Spring garden? 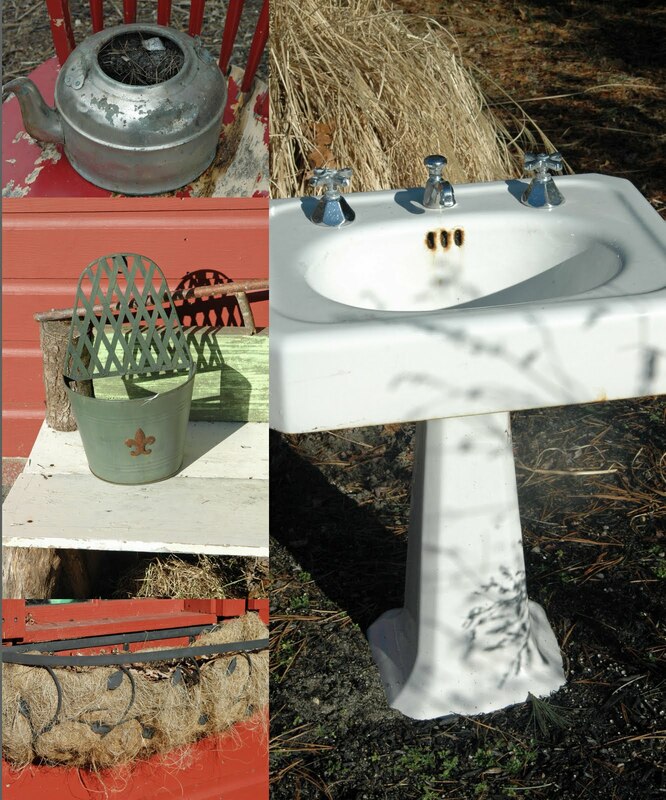 Michelle Rayburn's Trash to Treasure Friend Friday link up! Wow! What a farm friendzy we had last week! 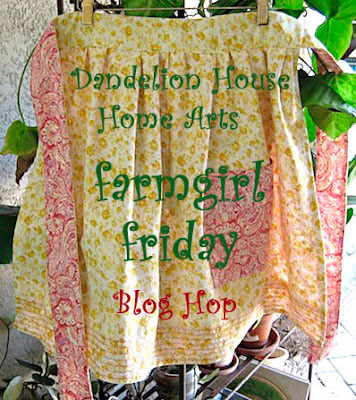 THANK YOU to all the farmgirls and farm friends who linked up, linked back and also added the Farmgirl Friday and Verde Farm Farm Friend Friday buttons to your blogs! If it weren't for you spreading the word we might not have topped the week with 94 amazing entries! I visited as many new farm friends as time allowed. What fun I had! I so enjoyed all of your comments and watching folks click that follow button both here and along the way while visiting other farmsteads! Did anyone else notice a definite theme last week? There was an abundance of the cutest baby farm animal pictures I have ever seen in one place! Spring on the farm is a re-birthing if I ever saw one! 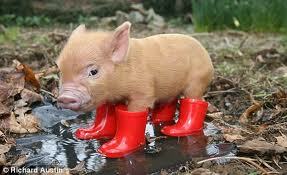 But I have never seen a Pig in Boots!Thanks to Lynn of Happier than a Pig in Mud now we all have. I think this sums it up for how we all feel about farm life, and FARM FRIENDS! Now it's time to link up for your weekly dose of Farmgirl and Farm Friend soul food!